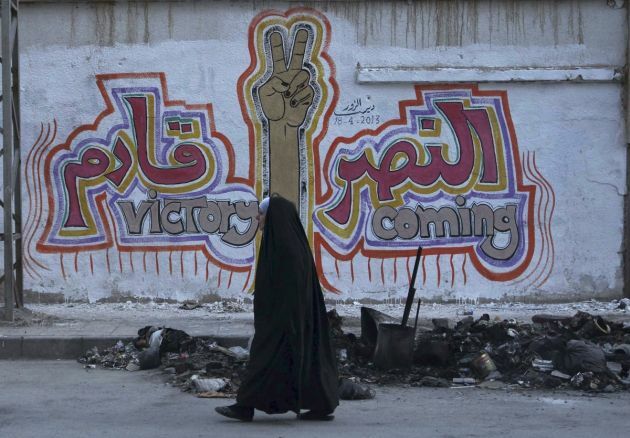 (Photo: Reuters / Khalil Ashawi)A woman walks along a street past graffiti that reads "Victory coming" in Deir al-Zor April 20, 2013. Picture taken April 20, 2013. AMMAN (Reuters) - At least 109 people have been documented as killed and up to 400 more are likely to have died in an almost week-long offensive by forces loyal to Syrian President Bashar al-Assad on a rebellious Damascus suburb, opposition activists said. If the accounts are confirmed, the killings in the mainly Sunni Muslim suburb of Jdeidet al-Fadel would amount to one of bloodiest episodes of the two-year-old uprising against Assad. Many of the dead were civilians, the activists said. Syrian state media gave no death toll but confirmed the army had been fighting in Jdeidet al-Fadel. It said it had saved the town from what it described as criminal terrorist groups, killing and wounding an undisclosed number of them. On Sunday activists said at least 85 people had been killed and the toll might reach 250, but with the army beginning to pull back they said more accounts were emerging which suggest the final figure could be even higher. The activists, speaking from the area, 10 km (six miles) southwest of Damascus, said residents had buried some victims in the early stages of the five-day attack by elite forces and pro-Assad militias. More bodies are now being found burnt or summarily executed in buildings and streets. They said rebel brigades who numbered around 300 fighters withdrew two days ago, leaving Assad's forces in total control. The working-class district is one of several Sunni Muslim towns surrounding the capital that have been at the forefront of the uprising. It is situated near hilltop bases of elite forces which are mostly from Assad's minority Alawite sect, an offshoot of Shi'ite Islam that has dominated Syria since the 1960s. Documented deaths of people who were discovered in the street and buildings on Saturday and Sunday and later buried in mass graves stood at 109, the opposition activist said. Activist Abu Ahmad al-Rabi' said they included seven refugees from nearby towns found shot dead inside a residential building. Dozens of bodies were also seen near a disused railway line in the centre of the district but the presence of army patrols have prevented the collection and documentation of victims. "Assad's forces are beginning to withdraw from Jdeidet al-Fadel but they are still there patrolling the streets and there are snipers deployed," he said. In addition to those buried over the weekend, and those bodies reported lying in the streets, between 100 to 200 people were killed and buried in the first three days of the fighting, the activists said. Shamel al-Golani of the opposition Sham News Network said among the hardest hit areas was a neighborhood adjacent to the 100 army brigade, one of several elite units based around Jdeidet al-Fadel. "In the first three days the army would go into neighborhoods and commit killings and withdraw and come back the next day," he said. "Many of them who were killed early were refugees from Daraya and al-Mouadamiya and were buried quietly," he said, referring to two adjacent suburbs that have been the scene of fighting and several army incursions. Assad's forces have been accused of massacring hundreds of Sunni Muslims in areas they stormed in Hama and Homs provinces and Damascus suburbs. International rights groups say rebel forces have also committed atrocities, although on a smaller scale. Jdeidet al-Fadel lies on the road from Damascus to the Israeli-occupied Golan Heights. Its residents are Golan refugees and in the last year thousands of families from nearby areas took shelter in the town. The Local Coordination Committee, an organization of grassroots activists, put the death toll at 450, while the Syrian Organization for Human Rights (Sawasiah) said the number of victims was at 500. In a statement, Sawasieh said the army forces included elite Republican Guards, the 100 and 153 artillery brigades and the 555 brigade, formerly known as the Defense Brigades. Units of "sectarian militia" supported by members of airforce intelligence, one of the most feared of a myriad of secret police branches, accompanied the army units, it said. According to witness accounts interviewed by the Syrian organization, water and electricity were cut off from the town and residents were not allowed to leave as Assad's forces blocked the entrances of the suburbs. Many of the victims, Sawasiah said, were civilians, targeted because the suburb was an "incubator for armed resistance" and showed solidarity with refugees in adjacent towns also subjected to mass killings.